Here's a look at how brands are celebrating women today. It’s International Women’s Day, and once again brands are out in full force to support women around the world. It’s become commonplace for brands to launch a campaign, announce fundraising for female-focused funds and so on during the month of March and in honor of this day specifically. From elevating female artists to combating sexism, here are some of the ways brands are celebrating women today. 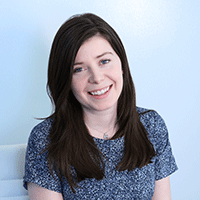 Only 61 percent of ads out in the world today portray women in a positive light. Budweiser wanted to make a statement about that not by pointing a finger at others but instead looking back at some of the brand’s old campaigns. 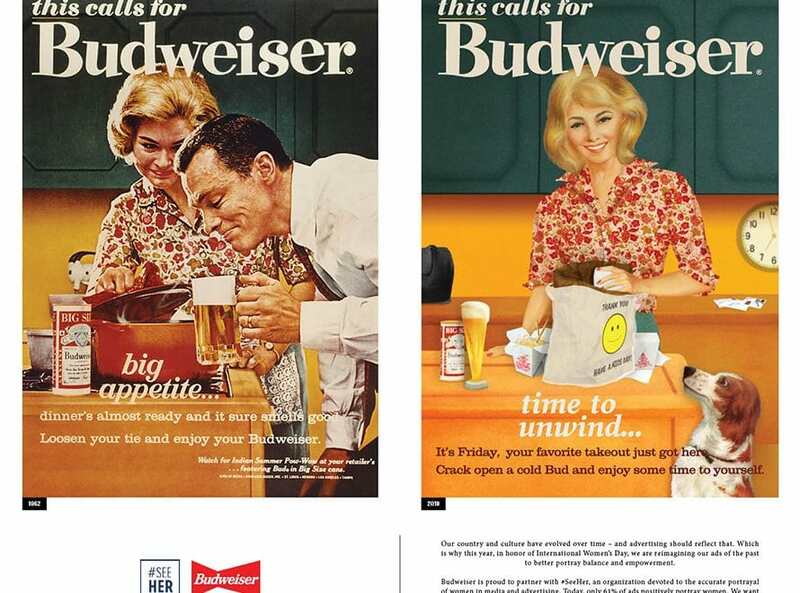 Budweiser took three ads from the 1950s, a time when women weren’t typically portrayed in a powerful way, and reimagined them for 2019. Budweiser worked with illustrators and the #SeeHer community to transform the images into ones that champion women and paint women as strong and independent. There’s no shortage of strong, powerful women featured in some of HBO’s biggest shows, from Game of Thrones to Big Little Lies. In honor of those women, HBO released the spot “Make a Little Trouble,” created by HBO Creative Services and Mekanism New York. The ad is part of the “Because of Her” campaign and featured a speech that Nora Ephron delivered to Wellesley College graduates in 1996. Throughout March, PayPal will be highlighting stories of female-run businesses and will donate $2 to the PayPal Giving Fund for every purchase made at a select number of retailers (including ThirdLove and Food52). The brand will donate up to $30,000 to a select group of charities through March 23. The brand also filmed PayPal’s evp, chief business affairs and legal officer Louise Pentland in conversation with Heidi Zak, co-founder and co-CEO of ThirdLove; Kara Goldin, founder and CEO of Hint Water; Blythe Harris, co-founder and chief creative officer at Stella & Dot; Lisa Edwards, svp of global boutiques at Benefit Cosmetics; and Yunha Kim, founder and CEO of Simple Habit. ModCloth launched a star-studded “Against the Current” campaign with Halsey, Awkwafina, Dascha Polanco and Hari Nef to celebrate International Women’s Day. The work is meant to encourage women to tap into their inner strength and overcome life’s obstacles. The anthem spot shows each of the four women overcoming the elements (earth, water, wind and fire) while solo spots dive deeper into the challenges and obstacles each of the four women have had to overcome. This year marks the fourth year of Brawny’s “Strength Has No Gender” campaign, an effort from the paper towel company that highlights strong woman of all ages. This year the brand created “Generations of Strength,” a 45-second spot applauding brilliant woman throughout history. Brawny will once again replace its signature Brawny Man mascot on its packaging. This year the brand will have three women from different generations on the commemorative packs. 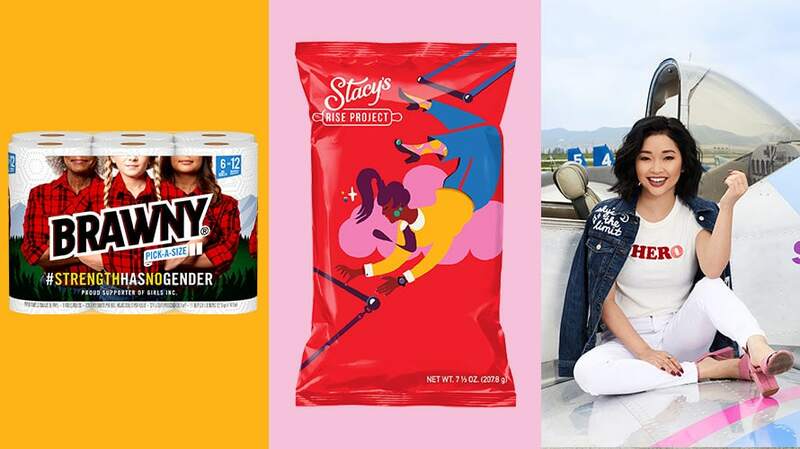 Finally, the brand is also entering a multi-year partnership with nonprofit Girls Inc.
For 2019, Stacy’s Pita Chips will release limited-edition bags of chips designed by all female artists for the third year in a row. The colorfully illustrated bags depict the six stages of a female entrepreneur’s journey: inspiration, courage, grit, nourishment, success and community. Additionally, the brand is pledging to raise up to $400,o00 throughout the month—$200,000 to help United Way achieve its mission of reducing the funding gap for female-founded businesses and $200,000 solely to help female entrepreneurs achieve their goals. “Together with Stacy’s Pita Chips, we are bridging the gap and helping female businessowners pursue their passions. Each donation will help provide funding support that will not only initiate new female-led businesses but sustain their growth through the years,” Lisa Bowman, CMO, United Way Worldwide, said in a statement. For Women’s History Month, United Airlines is championing female artists by giving two women the chance to create something on a massive canvas: the side of United Boeing 757. According to research from The National Museum of Women in the Arts, while 51 percent of artists are female, less than 13 percent of art shown in museums is done by female artists. So, United created “Her Art Here” in partnership with Laundry Service and Cycle Media. The campaign also includes interactive out-of-home in New York and Los Angeles.